So far in 2014, $113.2m has flowed into bitcoin businesses, which is 29% greater than the total amount for last year, which stands at $88m. In 2012, bitcoin startups raised just $2.1m, according to CoinDesk statistics. The most active investor so far this year, by number of investments, was 500 Startups, which bought stakes in five companies. The Bitcoin Opportunity Fund, marquee venture capitalist Tim Draper and Crypto Currency Partners also made two investments apiece this year. The 500 Startups investments were much smaller and earlier stage bets, at about $100,000 each, compared to the seven-figure rounds the other investors participated in. Venture funds were most attracted to exchange businesses in terms of the number of investments made. Exchanges attracted seven investments worth about $21m in total. Financial services and payment processors were the next most popular investment categories, by number of investments made. The category that raised the most amount of funding was payment processors, with a total of about $31m raised. Wallet services, mining and exchanges were second with about $21m raised each. Noteworthy was the fact that the mining category comprised just one investment, worth $20m, in BitFury. Topping the fundraising table so far this year is payment processor BitPay, which raised a record-breaking $30m in May, following a seed round of $2.7m last year. The round was led by Index Ventures and included Peter Thiel’s Founders Fund, Sir Richard Branson and Yahoo co-founder Jerry Yang as marquee names. BitPay executive chairman Tony Gallippi told CoinDesk that the new money would be spent on continuing to scale the business. Perhaps as a sign of the rapidly maturing bitcoin ecosystem, tied for second place on this year’s fundraising table this year are two startups operating on opposite ends of the bitcoin economy. BitFury, with its $20m funding, produces a critical piece of the bitcoin economy’s infrastructure: blazingly fast ASIC miners. Xapo, meanwhile, raised an equal amount based on its promise of bringing bitcoin transactions to debit cards and providing more secure wallets. The five startups that raised the most funds this year accounted for $97m of total venture capital invested, or 84% of the total. Bitcoin may be a global, decentralised digital currency, but the United States remains the clear favourite for startups operating in the bitcoin ecosystem. Some $172m of all venture funding for bitcoin companies tracked by CoinDesk so far has gone to companies headquartered in the US – a 75% share of the funding pie. That trend hasn’t changed in 2014, with US-based companies raising $78m in total so far – 68% of all venture capital investment in the space. 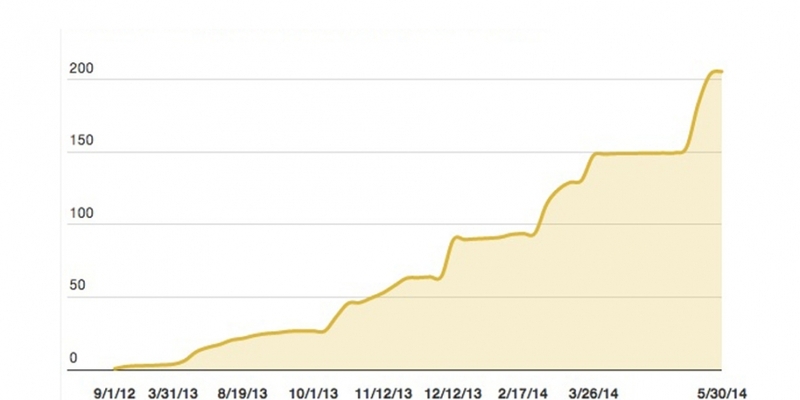 It’s clear from the data that bitcoin startups are gaining traction among venture investors. As financial and human capital continues to pour into the digital currency space, bitcoin bulls will continue to find reasons to cheer. However, it’s also worth putting bitcoin investment activity into context. The total amount of venture funds raised for financial services firms last year was some $566m, according to the National Venture Capital Association in the US. Bitcoin still has a long way to go. Along with many others in the investment space, Rui Ma from 500 Startups and Index Ventures’ Jan Hammer will be appearing at CoinSummit London this July.